Dear Noah's Art Enrichment, I am amazed at the things you do with a bunch of 3/4 year olds! Noah stays after school once a week for an art class. While we do lots of art projects at home, I'm constantly impressed with the things Noah brings home from this weekly class. They teach the kids such cool techniques and do things I would never even think of! Dear laid back weekends, I love you! The majority of the year, we fill our weekends to the brim. While most of our plans are super fun, we don't set aside much time to just sit back and hang out. But in the winter, there naturally aren't as many plans, meaning we have more weekends spent at home in our pjs/sweats, just playing and hanging out. And I have to say that I'm really loving it. I may need to build more downtime into our weekends going forward! Dear Costco, you sure do know what you're doing the day before Super Bowl. The samples you put out are delicious and perfect for the big game! The store may be super crowded, but it's totally worth it. We learned this last year by accident and this year Chris purposefully scheduled our trip for the Saturday before the Super Bowl just so we could try all the yummy food! Dear photography class, thanks for helping me shoot better in low light! I loved learning about composition and all that other good stuff, but the whole low lighting thing really helped me this time of year. I feel more confident taking photos of Noah inside our house during the winter now! Dear Lunch Bunch, I think I'm gonna like you. Just a few weeks ago, Noah started staying after school a couple days a week for lunch. Not only does Noah staying for lunch give me a little extra time to get stuff done, but Noah loves it! He loves packing a lunch, finding the notes Chris and I leave him, and eating with his friends! Dear Noah, thank you for trying some new foods lately! For a while now, Noah's been a pretty picky eater. While he likes lots of healthy fruits and vegetables, he can be pretty picky and not willing to try new things. He also has a thing against most meat. But just recently he tried English Muffin pizzas and rotisserie chicken and liked both! He also tried my Chicken Francese (and didn't like it), but the important part is that he tried it! Dear tree that fell down in my backyard after a windy storm, you made me a little worried. When I saw a huge tree down in my backyard, I immediately saw dollar signs. Having a tree removed is not cheap! Thankfully, since we live in an association, and the tree was on the back part of our property, the association is responsible for removing it. I'm also really relieved that the tree didn't hit our house or our deck... that would have been horrible! 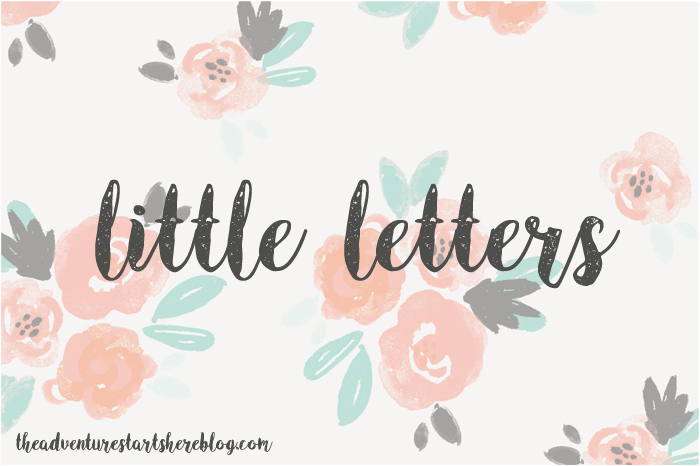 Any " little letters" you need to write at the moment? I want to take a photography class! I hope your dad gets well soon. So glad you didn't have to pay to remove the tree!!! So pricey! I'm glad to hear that someone else is paying for that tree clean up! It's crazy how expensive tree trimming/cutting down is. It sounds like Noah is doing awesome at school, making great art and trying new foods. Way to go! I love when my daughter is willing to try something new even if she doesn't love it. Shwoo you really dodged a bullet with that tree. It is CRAZY what people charge to bring one down! Well wishes for your dad! That's so fun that Noah gets to stay and eat lunch with his friends after school! And I'm seriously constantly blown away at the art projects that Mason comes home with from school and speech. Seriously, they are so creative! Connor is currently trying new foods too. I'm aiming for just 1-2 a week because I don't want to push my luck. This week he tried and liked spaghetti squash but he thought it was a new kind of noodle. The Art enrichment class sounds awesome! You should post some pictures of the art work. I would love to see! I hope your dad gets to feeling better soon. It’s so fun to be sick with a lingering cold. Visiting Costco before the super bowl is a genius idea! We went yesterday and they barely had any samples out. Bummer! Ooooh, I would love to learn how to shoot in low lighting. I really struggle with that. Yikes! That is super scary about the tree! I always have that fear, but especially lately with the crazy wind we have been having! Hope your dad feels better soon! Did you LOVE the photography class? Was it worth the money?